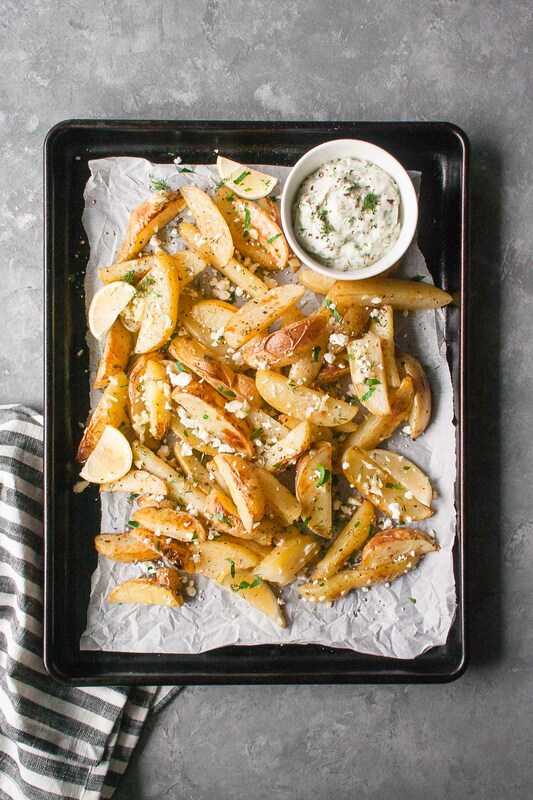 Crispy homemade fries topped with dairy free tzatziki, feta cheese, and parsley – these whole30 baked greek fries are the perfect addition to any meal! I’m very very glad we are here. For me, September signifies the end of summer, the start of the school year, and a new beginning. I like to set goals for myself and what I hope to accomplish for the rest of the year. And one goal that comes back again and again is eating well. Overall, I eat very well. I am conscious of the foods I choose to fuel my body and typically know what works best for me. But summer always teases me – teases me with mid-week cocktails on the patio, ice cream on hot days, and the constant desire to skip dinner at home and go out for dinner al fresco. For all of these reasons, September is a big month for the Whole30 community – second only to January! I couldn’t commit to doing a full Whole30 this month. Between weddings, a weekend visit from my mom, a food festival I am covering for work, things just didn’t work out. But, I will be eating as Whole30 as possible all month long and sharing what I am eating over on my Instagram stories! And I will – OF COURSE – be sharing Whole30 approved recipes with you all month long! Hubba hubba. These babies are GOOD. 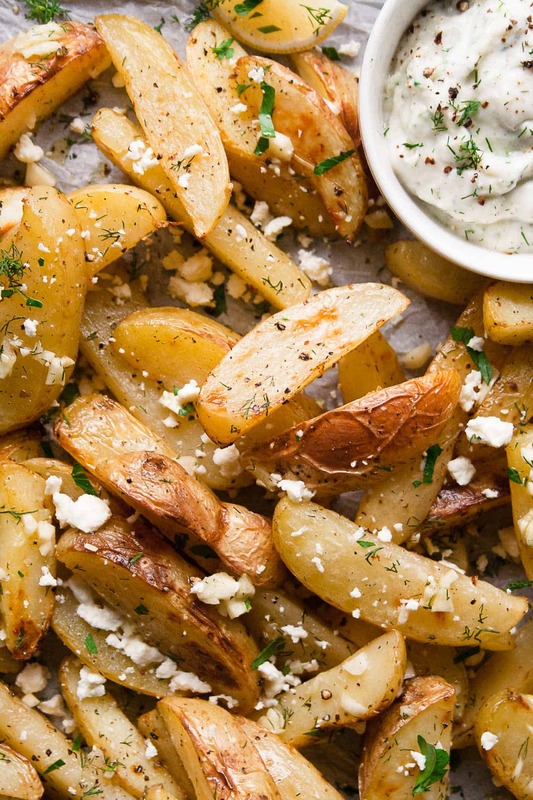 It’s hard to pick a favorite food, but potatoes (in any form) are at the top of the list! And this latest variety is at the tippy-top. 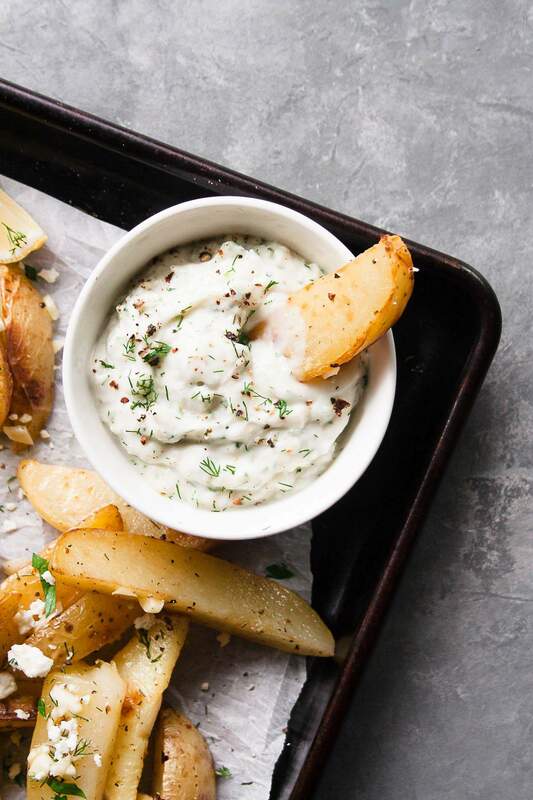 First, let’s talk tzatziki. Tzatziki is a traditional sauce that is served over meats or as a dip; it is made with yogurt, cucumbers, garlic, salt, lemon, olive oil, and sometimes other spices. If you’re making this and not doing a Whole30, plain greek yogurt would definitely do the trick. But, if you’re avoiding dairy, I suggest using a thick coconut yogurt (my favorites: one and two OR you could make your own with this recipe). And onto the fries. I love using Yukon Gold potatoes because of their creamy consistency but any potato will do. All you have to do is toss them in some olive oil, salt, pepper and some herbs and bake! Voila! The perfect Whole30 approved side dish to serve with any meal – enjoy! 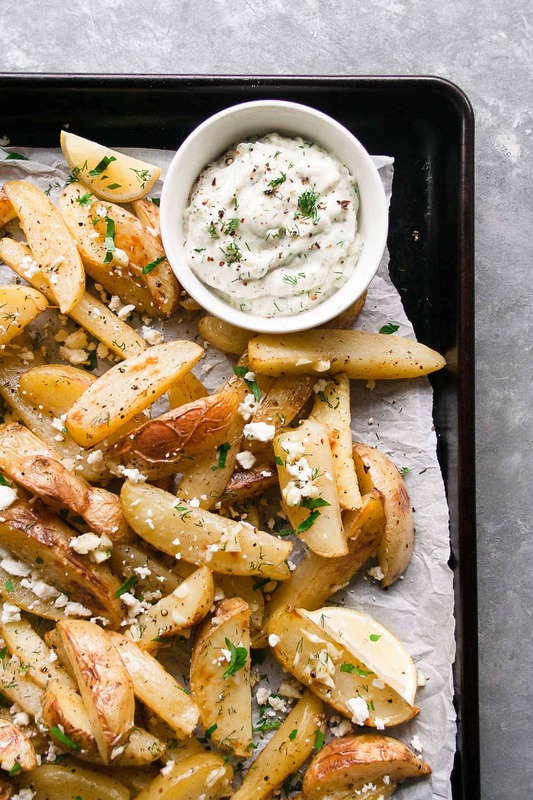 Make these Baked Greek Fries and post a picture on social media and use the hashtag #imhungrybynature for a chance to be featured! Place the potato wedges, 3 tablespoons of olive oil and salt and pepper in a zip top bag and shake to combine. Transfer the potatoes to a parchment lined baking sheet and evenly spread out the wedges. Transfer to the oven and bake for 35-40 minutes, flipping once, until evenly baked and golden brown. While the fries bake, make the tzatziki: Finely grate cucumber with the skin on – this should yield about 1/3 cup. Using a thin towel, squeeze out excess moisture. The remaining amount should be about 1/8 cup. Add all tzatziki ingredients to a bowl and combine. Taste and add additional spices if necessary. Whisk remaining olive oil, chopped garlic, parsley and dill in a large bowl. Add the mixture to the hot fries and toss to combine. Taste and season with extra salt and pepper as needed. Arrange on a platter. 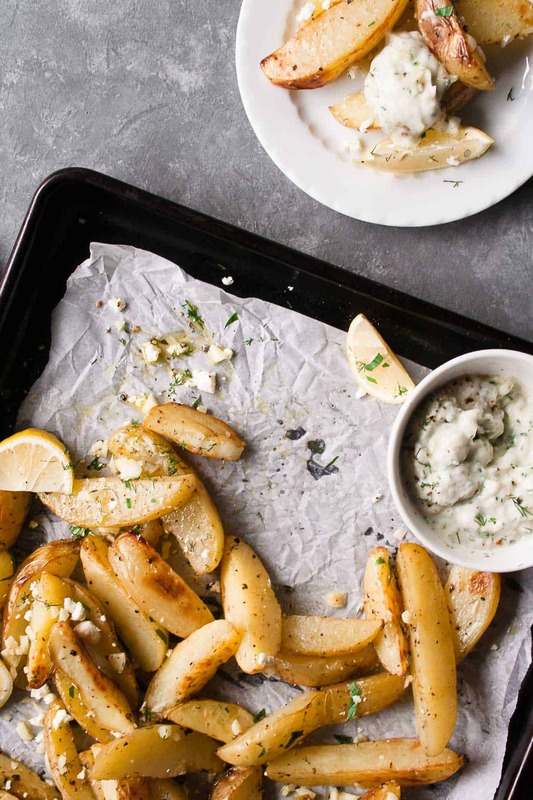 Sprinkle with feta and and serve alongside dairy free tzatziki and lemon wedges. Adjust salt as needed.